Here we go again, mixing fact with fiction to promote a point. It seems that the point of today's article in the NY POST is the failure of the Renewal Schools program, and the more press the better, I think. The Renewal program failure is really shocking considering how much public money was spent (see the article I re-posted, below, where the POST editors call the Renewal program a "Fiasco"). My problem with this newest attack on this dreadful mistake (WHY NOT create an effective strategy first, and get a panel of successful business people to volunteer to advise you, Mr. Mayor?) is the quote by Clara Hemphill, a person who knows absolutely nothing about NYC teachers and ATRs. I know that teachers and ATRs often want to be in the neediest schools with the neediest kids, but are squashed by the observations without facts and sabotage of principals who need to pass the buck from their own wrong-doing or incompetence. The administrator who sees results of state or local exams which are not good can suddenly rate the teacher/ATR "developing" or "ineffective/Unsatisfactory", accuse this person of some fake crime and remove him/her to a hidden rubber room. Ms. Hemphill implies that the needy kids get "the worst" teachers who don't know how to teach these kids or don't want to. I'd like her to prove that. I believe she can't, and thus there it is, the Fake News, passed along with just enough facts to pass close scrutiny. They are the schools Mayor de Blasio doesn’t mention. Mayor de Blasio last week claimed “impressive gains” for the schools in his signature $383 million Renewal turnaround program. We wish it were true. By the numbers, these schools did make some gains on state exams, relative to other city schools. But that’s largely, maybe exclusively, because the state Regents “dumbed down” the tests. Simply put: If you make it easier to score as “proficient” (as the Regents have done), then schools where most kids weren’t testing as proficient will make bigger gains than schools where most kids were passing. And even this mirage of a gain doesn’t make up for the ground the Renewal schools lost in the first two de Blasio school years. Pretend the progress is real, and the math-proficiency gap between Renewals and the rest of the city still grew from 25.1 points in 2013 to 28.4 points in 2017. The English-proficiency gap grew from 20.2 points in 2013 to 24.7 points. Plus, Team de Blasio has had to close or merge several of the original 94 persistently failing Renewal schools, thanks to plummeting enrollment or woes too serious for even this administration to tolerate: Only 78 will open this fall. A Post series this spring shined a spotlight on the Renewal mess: On top of falling enrollment, they suffer from skyrocketing costs, unfit teachers and regular grade-fixing scams. A later Post investigation showed that at least 242 graduates at Renewal high schools earned their diplomas via an appeals process that allowed students to “pass” the Regents’ exams with normally too-low scores. At least the mayor’s credit actions are more realistic than his happy talk: The city has announced that more Renewal schools soon will be slated for closing or merger — and several will get new principals this year. The fact remains: His orders have left thousands of students wasting years failing to learn at schools he should have closed back in 2014. He kept them open in a bid to “prove” they could be turned around instead. Every child stuck at these schools is a victim of his effort to experiment with their lives. 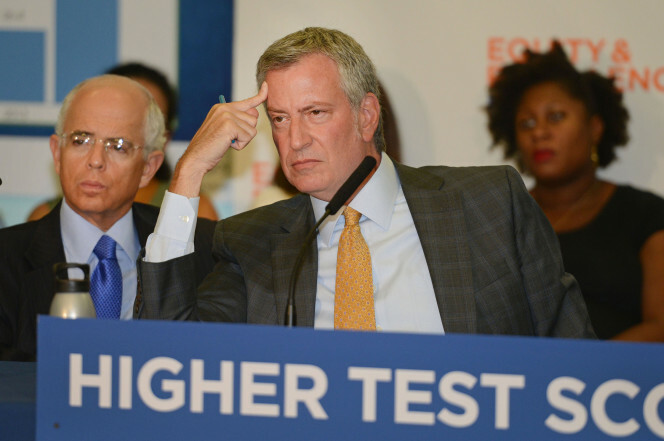 Mayor de Blasio has been boasting about how graduation rates are up at some of the city’s worst schools — but the improved numbers come with a big asterisk, The Post has learned. Of the 3,371 graduates at the 31 high schools involved in Hizzoner’s Renewal Schools program, as many as 242 earned their diplomas using an appeals process that allows for lower scores on exams or other side-door routes. The new appeals, created and approved by the state Board of Regents, allow students graduating in 2016 to pass through on appeal even if they got as low as a 60 on two of their five Regents exams. The 2015 requirement to file an appeal was 62, while the regular passing mark for a Regents exam is 65. This led to a tripling of the number of students graduating using the appeals process in 2016 over 2015, city data show. “There does appear to be a concerted effort to use the appeal process to raise the graduation rate,” said David Bloomfield, a professor at the CUNY Graduate Center who reviewed data provided to The Post by the Department of Education. If there hadn’t been accommodations made for low-scoring students, graduation rates at Renewals Schools would have ticked up by just 0.6 percent — up to 55.1 percent from 54.5 percent in 2015. Instead, the graduation rate at Renewal Schools was 59.3 percent last year — an additional 4.2-percent increase. The board also created a “Superintendent Determination” for special-education students that allows them to graduate based on their coursework if they scored at least a 52 on math and English Regents. DOE officials said there was no way of determining whether the bulk of appeals students would have otherwise graduated. With appeals, schools not under the Renewal program had a graduation rate of 73.7 percent in 2016. Without them, the graduation rate would have been 71.5 percent, according to figures confirmed by Aaron Pallas, a professor at Columbia University Teachers College. Last month, The Post documented the struggles of de Blasio’s Renewal Schools program, including dropping enrollment, skyrocketing costs and mixed academic results.